It’s a new year, and resolutions abound. So many of the promises we make to ourselves seem to focus on food. Eat healthy! Eat ethically! Eat locally! But we’re all busier than ever, so wandering the streets of downtown Montreal in search of the perfect lunch (and usually ending up at the same underground food court) just doesn’t make sense. To get you started on the right foot, the Reporter went looking for the new, lesser-known, unique or just plain impressive dining options on campus, in the hopes that one of them will help you achieve your gastronomical goals in 2012, without wasting your time or breaking the bank. Bon appétit! 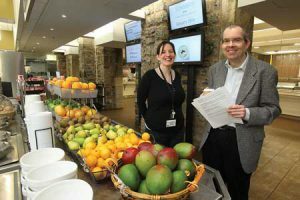 Arguably the best-kept food secret here on campus is that everyone – students, faculty, staff and members of the community – can eat at any of the five McGill residence dining halls. If the thought of a “dining hall” conjures up visions of bland offerings being spooned haphazardly onto a partitioned orange tray, you’re going to be pleasantly surprised by what’s cooking in these ones. chia seed), a custom omelet, a vegan smoothie, or some kiwi or cantaloupe from the astounding variety of fresh fruit and seasonal berries. RVC will completely change your view of on-campus dining. St. Viateur bagel is more your style. Whatever you choose, a bevy of truly unique options make Carrefour Sherbrooke worth the trip. Macaroni and cheese might be a bit of a college life cliché, but it has a cult following and gourmet versions are popping up everywhere – including in the Redpath/McLennan food court. Every ingredient at Mac & Roni is customizable, so you’re in charge of what types of pasta, cheese, meat and veggies go into your artisanal creation before it’s sprinkled with breadcrumbs and popped in the oven. What’s more is that it’s absolutely mouth watering. Be sure to head out during off-peak hours to avoid lunchtime line-ups. They say Lady Justice is blind, but we hear her taste buds work just fine. She (and you) will be glad to know that Avvocato in Chancellor Day Law building (3644 Peel) has all the bases covered. The pulled chicken sandwich comes highly recommended, and you won’t object to the range of freshly-made frittatas and the stocked salad bar. If you work in the Tech Square, the walk downhill to the Engineering café (and back up!) can be daunting in the winter. Luckily, Rue McGill Deli in the Trottier building (3630 University) is there to help, offering a range of hearty options, especially the great sandwiches served on Première Moisson bread. We’d list them all, but the fresh-sliced Montreal smoked meat alone is reason enough to wander over from Wong, Rutherford or Genome. Coffee fuels students and staff alike, and everyone’s got their favourite. Van Houtte, Seattle’s Best and Starbucks are ubiquitous around the university, but did you know that McGill’s only Second Cup is nestled in the Stewart Biology building? And if you’re more of a tea drinker, check out the array of loose-leaf options at Infusion in the lower level of Strathcona Music. Most days, your hectic schedule might necessitate a grab-and-go lunch, but on the rare occasion when you’re able to enjoy a more leisurely meal, the licensed restaurant at Thomson House (3650 McTavish) has got you covered. This historic limestone mansion, run by the Postgraduate Student Society, is one of classiest dining experiences on campus. After dinner, take a moment to check out the building’s beautiful wood-carved features and ornate fireplaces. Oh, and remember to “like” their Facebook page to receive a daily photo of their Special du Jour. As you can see, food options at McGill are ever-changing to stay on top of current culinary and food-sourcing trends. There are also a host of Local Food Days and health and wellness events specific to each dining hall. To keep up with it all, visit the McGill Food & Dining Services website at www.mcgill.ca/foodservices, where you can find up-to-date listings of food providers, and submit your menu ideas and comments.